Huber Exhibiting This Week at North American Pultrusion Conference in Atlanta! 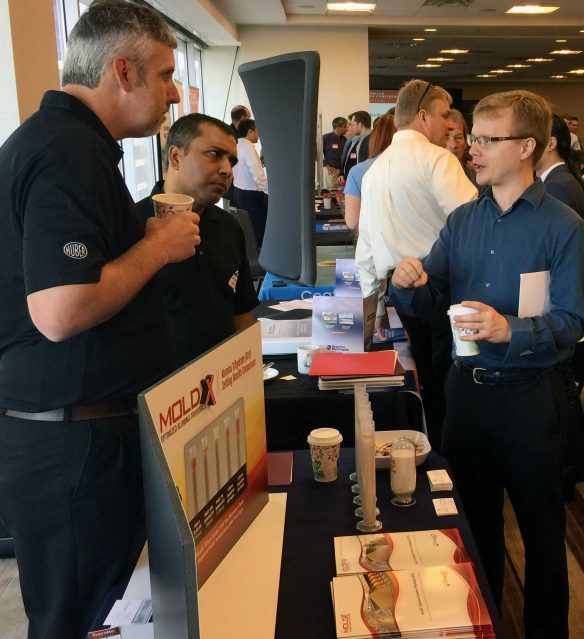 Huber’s Mark Herndon (left) and Lawanya Ojha (center) listen intently as a North American Pultrusion Conference attendee visits to ask questions and learn more about our exclusive MoldX® Optimized Alumina Trihydrate (ATH). With our headquarters located in Atlanta, Georgia (U.S.), it’s exciting today and tomorrow for us to be downtown within this hospitable and vibrant Southern city exhibiting at the inaugural North American Pultrusion Conference. About 150 industry professionals are gathered for the event which is being hosted and produced by the American Composites Manufacturers Association (ACMA) and the European Pultrusion Technology Association (EPTA). We’re showcasing our halogen-free MoldX® Optimized Alumina Trihydrate (ATH) for pultrusion applications. Our MoldX grades offer the formulator numerous benefits, including higher loading levels, with lower viscosity. Our MoldX® P18 grade is specially-suited and geared toward pultrusion applications. Before things heat up, Contact Us today for more information about our exclusive line of MoldX products.